Born 9 Sep 1923; death reported 12 Dec 2008 at age 85. The Virus that Ate Cannibals: Six Great Medical Detective Stories, by Carol Eron. - book suggestion. Born 9 Sep 1910; died 2 Sep 1995 at age 84. Swedish inventor of the Silva compass which featured a rotating compass dial, and a transparent protractor base plate. As founder of Silva, Inc. in North America, Kjellstrom helped introduce the orienteering sport to the U.S. in the1940s, in part as a way to promote his product. He wrote Be Expert with Map and Compass, considered to be the "bible of orienteering." The Complete Social Scientist: A Kurt Lewin Reader, by Kurt Lewin and Martin Gold. - book suggestion. Born 9 Sep 1853; died 13 Apr 1940 at age 86. British physicist who introduced a theorem (1884-85) that assigns a value to the rate of flow of electromagnetic energy known as the Poynting vector, introduced in his paper On the Transfer of Energy in the Electromagnetic Field (1884). In this he showed that the flow of energy at a point can be expressed by a simple formula in terms of the electric and magnetic forces at that point. He determined the mean density of the Earth (1891) and made a determination of the gravitational constant (1893) using accurate torsion balances. He was also the first to suggest, in 1903, the existence of the effect of radiation from the Sun that causes smaller particles in orbit about the Sun to spiral close and eventually plunge in. Born 9 Sep 1843; died 4 Nov 1921 at age 78. Swedish archaeologist who sought to establish foundations for prehistoric chronology, especially that of the Bronze Age in the British Isles and Europe northward to Scandinavia. He developed a relative chronological dating method, known as Swedish seriation. During the early ages of archaeology, accurate records were sometimes kept, sometimes not. His technique dated artifacts based on geography and comparisons from artifacts within a certain geographical area. Montelius' method looked at individual artifacts and placed them using contemporary written records on a timeline specific to the location. Based on the absolute date of that artifact, other artifacts of that geographical region are compared and dated. Born 9 Sep 1842; died 25 Dec 1899 at age 57. Elliott Coues: Naturalist and Frontier Historian, by Paul Russell Cutright, Michael J. Brodhead. - book suggestion. Joseph Leidy: The Last Man Who Knew Everything, by Leonard Warren. - book suggestion. Born 9 Sep 1794; died 11 Nov 1871 at age 77. Born 9 Sep 1789; died 29 Jan 1859 at age 69. American astronomer who, with his son, George Phillips Bond (1825-65), discovered Hyperion, the eighth satellite of Saturn, and an inner ring called Ring C, or the Crepe Ring. While W.C. Bond was a young clockmaker in Boston, he spent his free time in the amateur observatory he built in part of his home. In 1815 he was sent by Harvard College to Europe to visit existing observatories and gather data preliminary to the building of an observatory at Harvard. In 1839 the observatory was founded. He supervised its construction, then became its first director. Together with his son he developed the chronograph for automatically recording the position of stars. They also took some of the first recognizable photographs of celestial objects.Image: The Harvard College Observatory's 15-inch telescope known as “The Great Refractor”, installed 1846. Italian physician and physicist studied the structure of organs and the physiology of tissues who is best known for his investigation of the nature and effects of what he conceived to be electricity in animal tissue. He observed how frog muscles twitched when they were touched by metal contacts but he wrongly attributed this to innate "animal electricity" (the current was actually produced by the metal contacts). 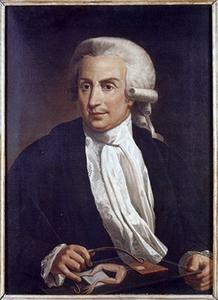 This was disputed by Alessandro Volta who, in the course of this argument, invented his electrochemical cell. The current produced by this device was for many years called galvanic electricity. The galvanometer was named after him. Welsh apothecary, active in Manchester scientific circles, who translated Antoine Lavoisier's Opuscles, and manufactured and sold calcined magnesia for medicinal purposes. Hungarian-American nuclear physicist who participated in the production of the first atomic bomb (1945) and who led the development of the world's first thermonuclear weapon, the hydrogen bomb. After studying in Germany he left in 1933, going first to London and then to Washington, DC. He worked on the first atomic reactor, and later working on the first fission bombs during WW II at Los Alamos. Subsequently, he made a significant contribution to the development of the fusion bomb. His work led to the detonation of the first hydrogen bomb (1952). He is sometimes known as “the father of the H-bomb.” Teller's unfavourable evidence in the Robert Oppenheimer security-clearance hearing lost him some respect amongst scientists. Died 9 Sep 2003 at age 99 (born 11 Nov 1903). English physicist who was a leading authority on high-voltage physics, a member of the Anglo-American team that worked on the atomic bomb, and the last surviving direct colleague of Ernest Rutherford, the father of nuclear physics. Allibone proposed to Rutherford that he could build a powerful generator to provide the huge voltages needed artificially to accelerate electrons in a vacuum tube. By 1927, Allibone had built the Voltage Doubler, a device in which electrons and atoms could be accelerated at high speeds, which was used by Rutherford and his team in their subsequent researches on particle acceleration. In 1944 he joined the British team working on the Manhattan project to build the atomic bomb in Berkeley, Cal., and Oak Ridge, Tenn.
Died 9 Sep 2003 at age 100 (born 8 Sep 1903). German-British pharmacologist who left Nazi Germany for Britain and became a leading authority on neurotransmitters in the brain. In 1936 she co-authored a classic paper proving that acetylcholine from nerves originating in the spinal cord triggers movement in muscles. She later showed that the hormones epinephrine and norepinephrine help brain cells communicate. Her classic paper on sympathin, published in 1954, helped to pave the way to transforming the lives of the mentally ill. Modern anti-depressant drug therapy is grounded in increasing the availability of amines, predicated on the idea that amines are present and active in the brain in the first place, something which Vogt did much to establish. Died 9 Sep 2000 at age 84 (born 21 Jun 1916). American astronomer who made seminal contributions to the study of solar radiation. He joined the Naval Research Laboratory in 1940 and developed defense-related radiation detection devices during WW II. In 1949, he obtained the first scientific proof that X rays emanate from the sun. When he directed the firing into space of a V-2 rocket carrying a detecting instrument. Through rocket astronomy, he also produced the first ultraviolet map of celestial bodies, and gathered information for the theory that stars are being continuously formed, on space radiation affecting Earth and on the nature of gases in space. He also made fundamental advances in the application of x rays to material analysis. The Astronomer's Universe, by Herbert Freidman. - book suggestion. American physical chemist, recipient of the Nobel Prize for Chemistry in 1974 for his investigations of synthetic and natural macromolecules. He researched commercially successful polymers, the processes by which polymers form, and their properties in bulk and in solution. Flory showed how an understanding the sizes and shapes of these flexible molecules is important to establish relationships between their chemical structures and their physical properties. Jacques Marie Émile Lacan was a French psychoanalyst who gained an international reputation as an original interpreter of Sigmund Freud's work. Probably the most controversial figure in French psychiatry, Jacques Lacan dedicated himself to getting strictly back to Freud by way of structural linguistics. After being expelled in 1953 from the International Psychoanalytic Association for unorthodox analytical practices, Lacan, along with Daniel Lagache, created the Societe Francaise de Psychoanalyse. As his theoretical positions continued to develop, Lacan and his followers went on to found the Ecole Freudienne in Paris in 1964. His Ecrits (1966) gained Lacan international attention. Leading intellectuals flocked to his seminars and he exercised a cryptic but powerful influence on the French cultural scene of the 1970s. Concerned that the Ecole was losing its integrity, Lacan dissolved it in 1980. Died 9 Sep 1975 at age 76 (born 31 Dec 1898). Sir John Eric Sidney Thompson was an English ethnographer who was a leading researcher of the Mayan people. Thompson devoted his life to the study of Mayan culture and was able to extensively decipher early Mayan glyphs, determining that, contrary to prevailing belief, they contained historical as well as ritualistic and religious records. Sir Eric Thompson believed that Maya society was organized around religion, specifically star-worship. He thought that the Maya lived peacefully in villages and were ruled by priests that were more concerned with making astronomical calculation than political competition for power. With the discovery during the 1980's of how to decipher the Maya language, it was learned that almost every aspect of the traditional view of the Maya was wrong. Maya Archaeologist, by John Eric Sidney Thompson. - book suggestion. Died 9 Sep 1917 at age 71 (born 4 Jan 1846). Died 9 Sep 1901 at age 45 (born 12 May 1856). Died 9 Sep 1896 at age 89 (born 22 Apr 1807). Died 9 Sep 1894 at age 67 (born 18 Feb 1827). German Egyptologist who pioneered in deciphering demotic, the simplified script of the later Egyptian periods. As a boy he visited the Berlin Museum and became fascinated with its Egyptian artifacts, an interest fostered by Guiseppe Passalacqua, the Museum's curator of the Egyptian collection. On visiting Egypt 1853 as consul for the Prussian government, he joined the French archaeologist August Mariette in his excavations at Memphis. He was director of the School of Egyptology in Cairo (1870-79). His greatest strength was the ancient Egyptian language, and a pioneer in the study of demotic. Brugsch recognized the Semitic side of Egyptian grammar, thus enabling a far more comprehensive and systematic understanding of hieroglyphs. Died 9 Sep 1841 at age 63 (born 4 Feb 1778). Swiss botanist whose prolific writings in taxonomy and botany were highly influential, particularly his belief that taxonomy should be based on morphological characters, and his scheme of classification, for which he coined the term taxonomy, prevailed for many years. Candolle achieved extensive subdivision of flowering plants, describing 161 families of dicotyledons, and demonstrated decisively the inadequacy of Linnaean classification, which his system supplanted. Candolle also contributed to agronomy and the linking of soil type with vegetation. He also pioneered the study of phytogeography, the biogeography of plants, by carrying out investigations in Brazil (1827), East India (1829), and North China (1834). Died 9 Sep 1770 at age 73 (born 24 Feb 1697). In 2000, the hole in the ozone layer over Antarctica stretched over a populated city for the first time, after ballooning to a new record size. For two days, Sept. 9-10, the hole extended over the southern Chile city of Punta Arenas, exposing residents to very high levels of ultra violet radiation. Too much UV radiation can cause skin cancer and destroy tiny plants at the beginning of the food chain. Previously, the hole had only opened over Antarctica and the surrounding ocean. Data from the U.S. space agency NASA showed the hole covered 11.4 million square miles - an area more than three times the size of the United States.Image, compiled from NASA's Total Ozone Mapping Spectrometer instrument onboard the Earth Probe satellite, reveals how the ozone hole (in deep blue) has extended as far as southern Chile. In 1945, the first “bug” in a computer program was discovered by Grace Hopper: a moth was removed with tweezers from a relay and taped into the log. Blazing The Trail: The Early History Of Spacecraft And Rocketry, by Mike Gruntman. - book suggestion. The Sanitarians: A History of American Public Health, by John Duffy. - book suggestion.